Onion, Mushroom, Green Peppers, Cheese & Tomatoes. Ham, Onion, Green Peppers & Cheese. Seasoned Beef, Cheese, Tomatoes, Onions, Olives, Salsa, & Sour Cream. 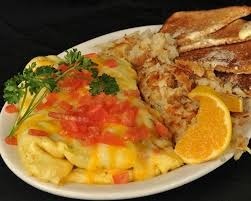 Hash Browns available at Gresham store only. 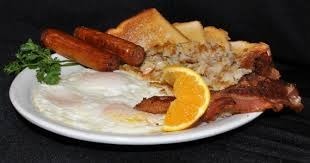 3 Eggs, 2 Strips of Bacon, 2 Sausage Links, Home Fries or Hash Browns & Toast.